› Author Affiliations Funding Funding for this research was provided to Policy Analysis Inc. (PAI) by Bristol-Myers Squibb (BMS) and Pfizer Inc. In the AMPLIFY clinical trial, apixaban was non-inferior to warfarin plus subcutaneous enoxaparin bridge therapy in the treatment of acute venous thromboembolism (VTE) and was associated with significantly less bleeding. This study evaluated their comparative effectiveness and safety in routine clinical practice. A matched-cohort design and data from four U.S. private health care claims databases were employed. Study population comprised patients who initiated outpatient treatment with apixaban versus warfarin (plus parenteral anticoagulant bridge therapy) within 30 days of their initial VTE episode; apixaban and warfarin patients were matched on age, characteristics of VTE episode, study database and propensity score. Major bleeding, clinically relevant non-major (CRNM) bleeding and recurrent VTE during the 180-day (maximum) follow-up period were compared using shared frailty models. During mean follow-up of 143 days among apixaban patients (n = 17,878) and 152 days among warfarin patients (n = 17,878), incidence proportions for apixaban versus warfarin, respectively, were 1.7% versus 2.3% for major bleeding, 7.0% versus 9.4% for CRNM bleeding and 2.3% versus 2.9% for recurrent VTE. In shared frailty models, risks of major bleeding (hazard ratio [HR] = 0.75, 95% confidence interval [CI] = 0.64–0.87), CRNM bleeding (HR = 0.77, 95% CI = 0.71–0.83) and recurrent VTE (HR = 0.80, 95% CI = 0.70–0.91) were lower for apixaban versus warfarin. 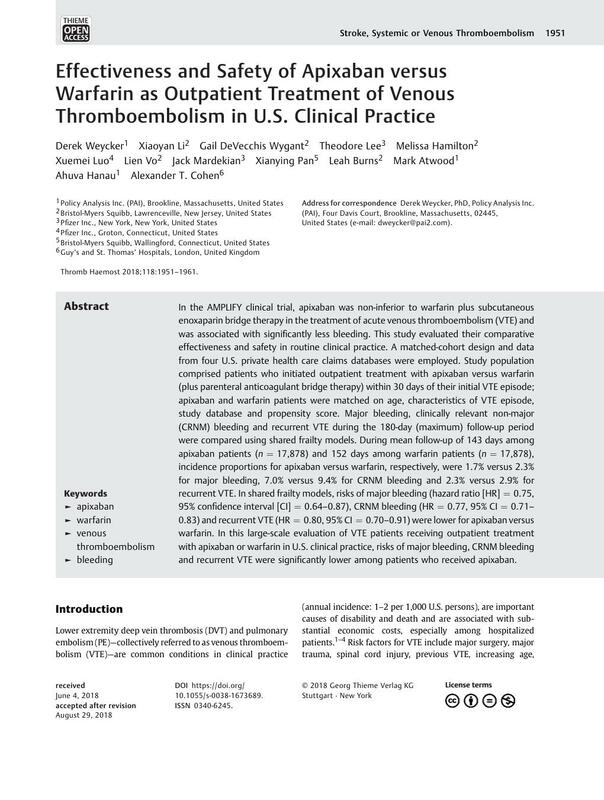 In this large-scale evaluation of VTE patients receiving outpatient treatment with apixaban or warfarin in U.S. clinical practice, risks of major bleeding, CRNM bleeding and recurrent VTE were significantly lower among patients who received apixaban. Some aspects of this research were presented at the American College of Cardiology's 67th Annual Scientific Session (March 2018) in Orlando, Florida.